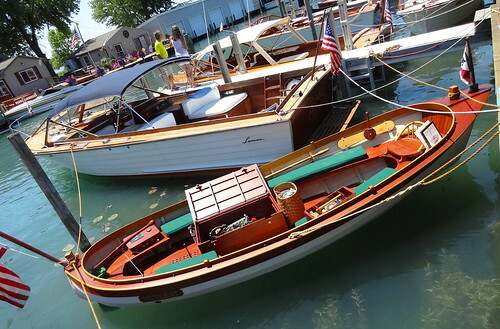 We are in the riverside town of Algonac MI, the Michigan chapter of the Antique and Classic Boat Society is hosting their annual boat show “The Annual Plant Jamboree, Where It All Began” at the Algonac Harbour Club. 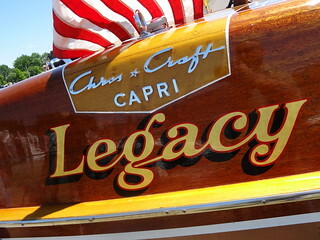 Michigan has a rich boating history, 4 of the major builders originated here: Chris Craft in Algonac, Century in Manistee, Gar Wood in Marysville and Hacker Craft in Mt Clemens. 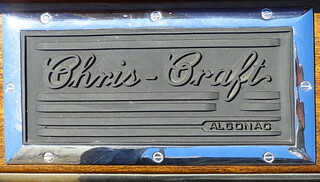 Since we are in Algonac, it seems fitting to give you a little background on Chris Craft. 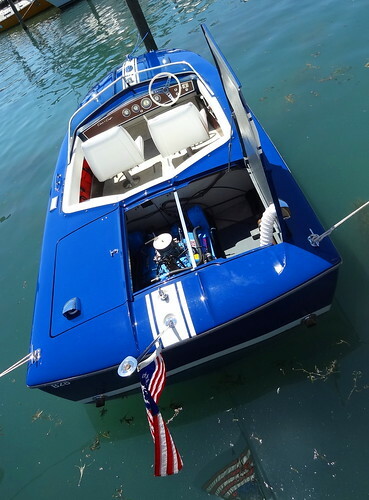 While I share the story with you sit back and relax, look at all of the beautiful boat pictures and imagine yourself out on the water in a magnificent, restored wooden power boat, cold drink in hand, soaking up the scenery. 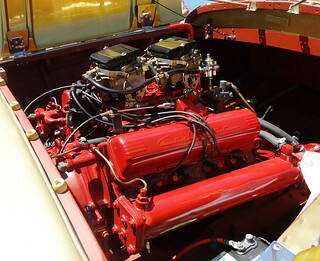 So here we are in 2016, Algonac is still referred to as the home of power boating, the Venice of Michigan, boating is a way of life here. 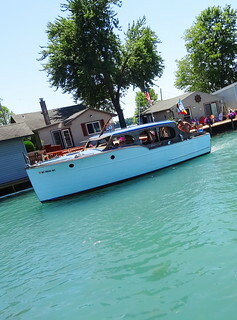 Residents drive their boats through turquoise-colored canals the way you and I drive through neighborhood streets. 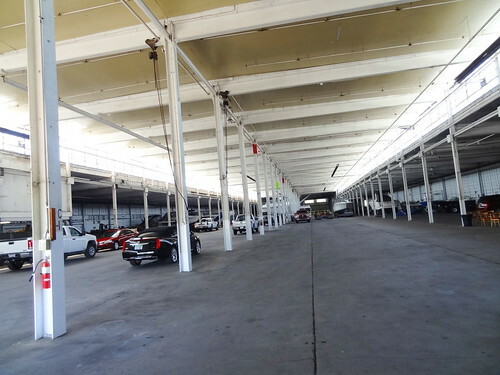 Fisherman are in pursuit of Pickerel, leisure boaters skim the water through canals out to the largest freshwater delta in the world, the St Clair Flats, Harsens Island, Muscamoot Bays and the St Clair river. Go north and you’ll spill out into Lake Huron, south will lead you through Lake St Clair, the Detroit River and eventually into Lake Erie. 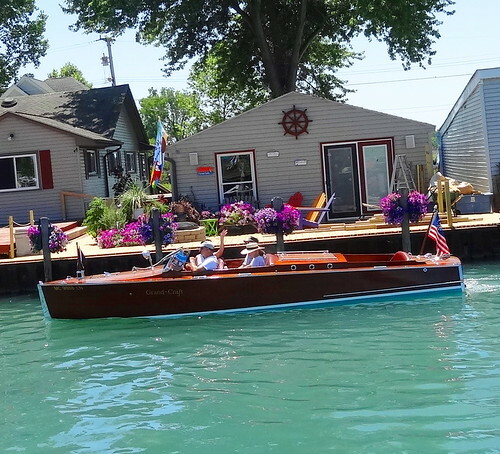 Michigan is special for its spectacular waterways, just look around and you’ll see why. Making our way through the marina we pass one beautiful boat after another, registration cards use terms such as woody, skiff, runabout, utility and cruiser. 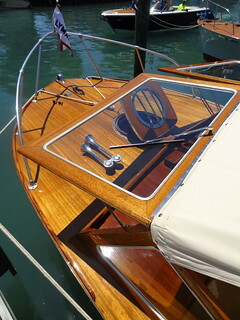 Mahogany gleams under layers of varnish, American, Canadian and Chris Craft flags waver under a cloudless sky. 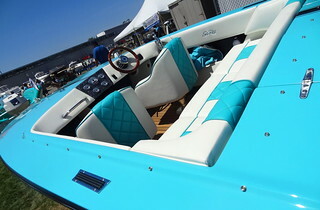 Interiors are upholstered in solid blues, greens and red and white stripes, some have separate seating compartments while others are wide open, dashboards are decked out with gauges, the sun reflects off sparkling chrome. 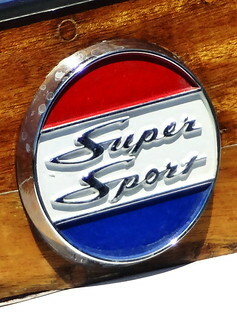 I love the name plates and badges especially the red, white and blue Super Sport, a boat named Tiger Lily catches my eye, what a beauty in light wood and yellow stain. The houses across the canal are dolled up for the summer, petunias spill from large pots, decks look BBQ-ready, what a quaint area to call home. 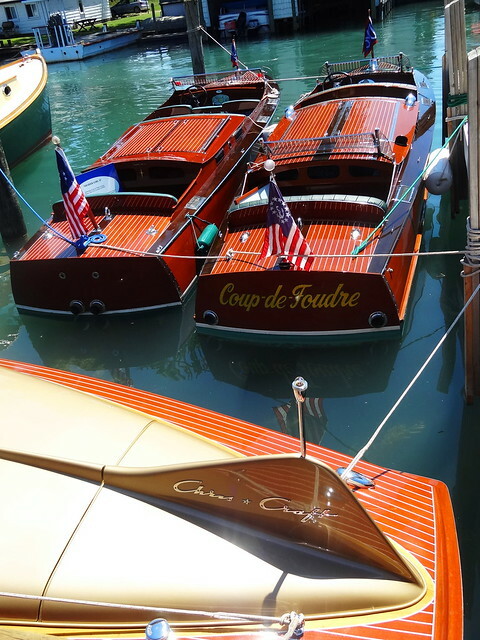 We follow the narrow walkway, wooden boats tied to deck cleats bob on tiny waves made from passing boaters, everybody wants to have a look. 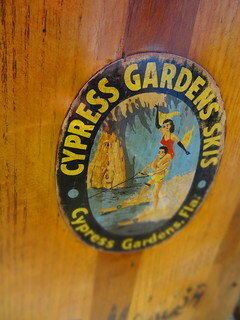 Some boats look ready for a fishing excursion while others display picnic gear, the vintage water skis are super-cool. 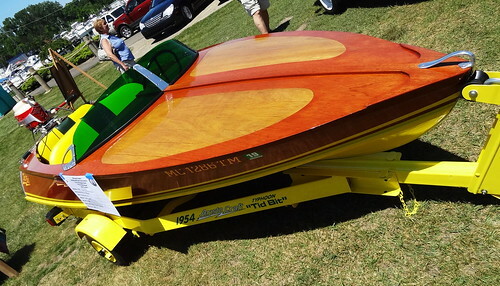 The water craft range in size from tiny fishing boats to ocean-going, I overheard one woman say they came up from Florida to be in the show today, the cabin boat she’s on certainly looks like it’s up to the voyage. 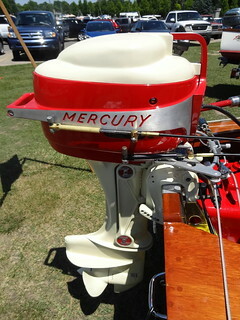 Engines bear names like Mercury, Chrysler Marine and even Cadillac, chrome horns rest on bows. 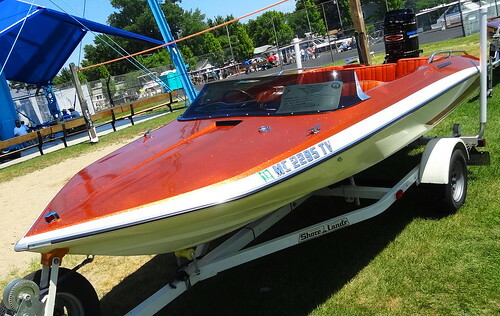 At the other end of the marina fiberglass boats from the 1960’s and 70’s wait for their turn on the lake; they wear bright colors, metal flake paint and cool racing stripes, James Bond would look perfect behind the wheel. 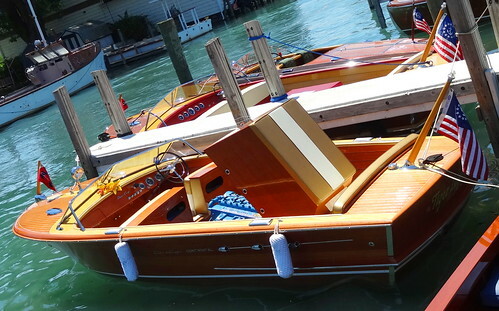 August 25-28 2016 will be the 100th running of the Gold Cup Races on the Detroit River, there will be a display of woody boats belonging to the members of the Antique and Classic Boat Society. Looking for something a little more laid back? 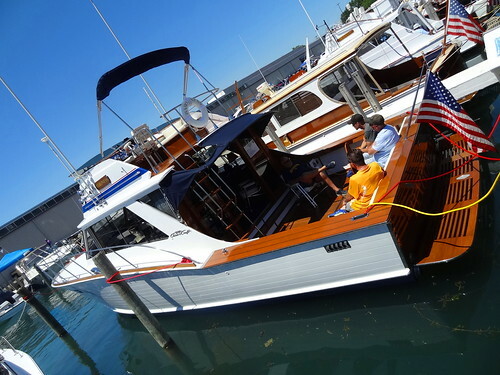 Head up to Port Huron September 9-10 for the Blue Water Antique and Classic Boat Show. Don’t forget the annual Parade of Lights on the Clinton River in Harrison Twp. August 6. 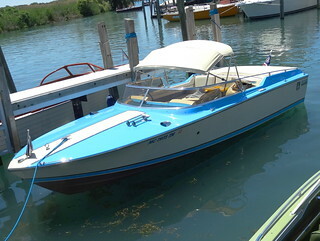 Waterfront dining is a must on a day like today, we follow M 29 north to Mc Rae’s Big River Grille. 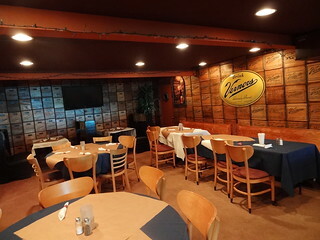 To the left the bar area pays tribute to Vernor’s; walls are covered in vintage wooden crates, a large yellow sign takes up real estate on one side. 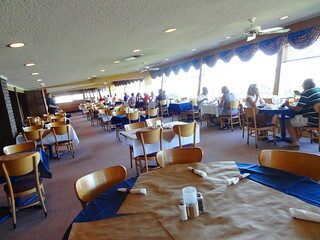 The dining room is huge, the length of the room is a wall of windows overlooking the glistening St. Clair River. 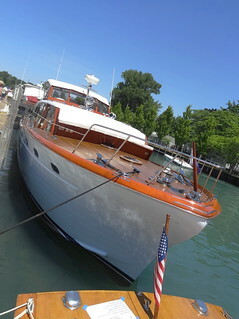 We place our order and sip on cocktails as we watch boats cruise up and down the river. 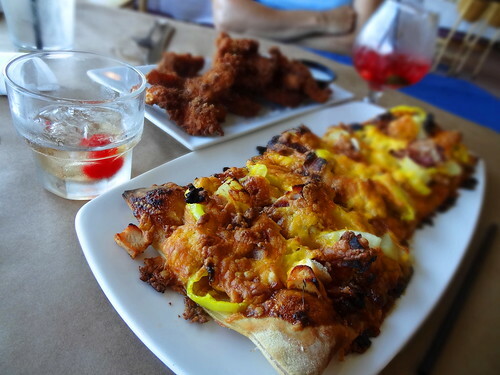 Our food arrives, we dig into the Sweet Honey Chicken Sriracha Flatbread, a little sweet, a little spicy; banana peppers, pineapple, bacon and cheddar cheese. The Coconut-battered Chicken Strips are crunchy and delicious. 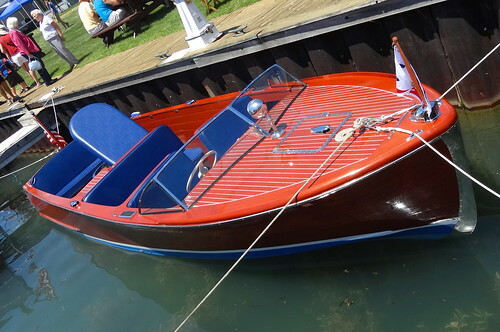 This is how a summer day should be, a picturesque drive along the water, gorgeous old wooden boats, dining on the river, perfect!